Break Up Soap Scum With Ease! 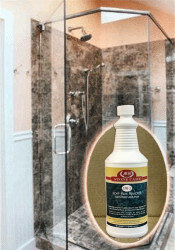 Cleaning marble bathrooms, granite countertops, tiled shower floors and walls is easy with a soap film remover ! It's safe. It's effective. It will not damage the polished surface of your stone! Hard water mineral deposits and unsightly soap film is easily removed with this specialized formula. It does effortlessly what can't even be done by hard scrubbing with ordinary cleaners and abrasives. Works wonderful for cleaning stone bathrooms and for that occasional deep cleaning of your granite countertops! It will also remove any grout film that may have been left on your stone by the installer! AND, it comes in QUARTS or GALLONS ! This highly effective cleaner is safe on most marble glossy surfaces as well as granite. Dilute 1 part to 2 parts of warm tap water. Scrub slightly with a scrub brush or plastic scouring pad. Stronger solutions can be used for extreme soiling conditions. The soap scum & mineral deposit remover is the very best product line available to the end user of Stone for cleaning stone, marble, & granite and for the care of countertops, vanities, shower walls, floors, AND all other stone burdened with mineral deposits and unsightly soap film. You can order this soap scum remover in quarts as well as gallons ! Thank you, the soap scum remover works GREAT. Just wanted to Thank you for your Awesome Stone Care Soap Film Remover! I have a new client with a Huge Marble Shower that was just covered with Water Stains. I know how delicate Marble is and your product has gotten most of the stains off. I will certainly spread the word!